Here are some trendy Chinese New Year snacks that your diners will absolutely love. Chinese New Year is usually packed with feasting and celebration. 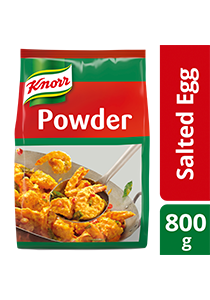 Prepare these delightful snacks with Knorr Salted Egg Powder, and get your diners into the festive mood! A one-step dish base for salted egg dishes. Add the corn flakes, followed by the seasoning ingredients. Stir thoroughly. When the ingredients thoroughly mixed, place in an oven preheated to 150°C. Bake until dry and crispy. Mix the salted egg sprinkle ingredients thoroughly. Deep fry the fish skin until crispy. Sprinkle 100g of the salted egg mix on the fried fish skin and mix well until evenly coated. Bake the popcorn for approximately 5 minutes until dry and crispy. Sprinkle 100g of the salted egg mix over the popcorn and mix well until evenly coated. Deep fry the potato slices until crispy. Sprinkle 100g of the salted egg mix over the potatoes and mix well until evenly coated.